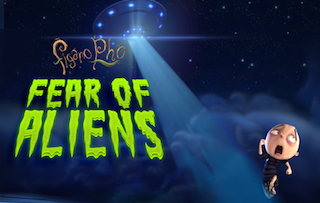 Banter - Figaro Pho Has A Fear Of Aliens This Halloween! Join Figaro on another fantastic adventure as he bolsters his courage to battle his Fear of Aliens. Available for both smartphone and tablet, Figaro Pho Fear of Aliens is the third in the Figaro Pho game series, following on from Creatures and Critters and Fear Factory. You can download Fear of Aliens right now via iTunes or via Google Play for only $0.99! And don’t forget to catch The Adventures of Figaro Pho tv series, screening weeknights at 8:45pm on ABC3 (check your local guides for details).